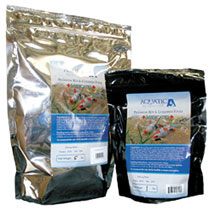 Blackwater Creek Koi Farms Medicated Koi food is effective against conditions associated with gram negative and gram positive bacteria. Small pellets are designed to sink to the pond bottom where sick fish prefer to feed. For best results, feed continuously for 10 days. Also contains: antibiotic derived from Streptomyces Kanamyceticus, Newmycin Sulfate, Pyridoxine Hydrochloride, Menadione Sodium Bisulfite complex, copper sulfate, manganous sulfate and ethylene diamine dihydrodide.